We promise and we deliver! What am I talking about? Well, after I posted a photo of my Wilson antenna sticking up from the bumper of the Best Little Trailer, Mick (my engineer friend and personal angel) and I received inquiries from readers wanting to know how they could have a Wilson antenna mounted on their RV, too. Mick went straight to work. And I do mean work. Not only did he type up how to make the bumper mount, he also created drawings and photos to show you how it should be fabricated. He compiled a list of the parts needed. He looked up the parts on Amazon so I could easily include my links. It’s a neat package that enables you to have a Wilson antenna mounted on the bumper of your RV for a reasonable cost. And he prepared all this for you at no charge. Click on that and scroll down. The links for Mount Plate and Mount Post will take you to the drawings. I am very proud to be able to present this to you on my blog. Thanks, Mick! As I start to prepare the page, “For better internet signal” . . . I look out the window and what do I see? A big ol’ coyote. He’s a healthy animal with beautiful, thick, tawny fur on a well-fed body. He walks completely across our campsite about 15 feet from the edge of the blue mat. Between the bird feeder and my camp chair, for crying out loud. He turns and strolls back across, as if displaying himself on stage. Holy crap! He isn’t skulking or sneaking. The closest word I can think of with which to describe his attitude is nonchalance. I sneak my hand over to pick up the camera. Immediately he notices me in the window and jogs toward the back side of the BLT. (I don’t get a photo. The one I show you here is a royalty-free pic I found on the web.) When he’s partially obscured by a bush, he pauses, digs for a few seconds, lifts up something floppy in his jaws, eats it, and calmly walks up the lane toward Rick’s place. There is a downside to having a successful bird feeder in the desert. When the doves and quail arrive, coyotes won’t be far behind. 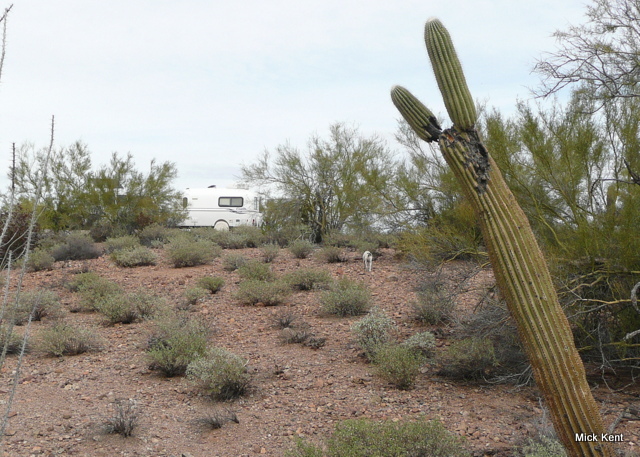 This entry was posted in Simple living and tagged antenna, cactus, casita, coyote, desert, quail, rat terriers, RV, wildlife, Wilson. Bookmark the permalink. your dogs are really smart. Do they do thetyping too or just tell you what to say. How do you file their nails so they can type????? Me imitate coyotes. I can see them holding their gut, rolling on the ground, laughing. Hehehe, the crew are too funny Rvsue. Thanks for all the good info…we have a Verizon hot spot and so far, have not had any problems getting good internet connections, but that might change when we get to Quartzsite. You’ll probably be fine in Quartzsite. Have a great time! The coyote sees what a wonderful canine life the kids have. He is after all a Ferrel canine. I can feel Bridget quaking with fear about now! 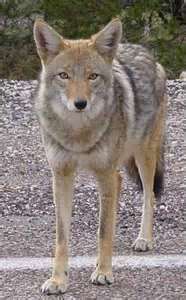 The coyote probably is used to people since they are in his/her territory so often. Also, I bet there are people who are careless enough to leave their garbage out which makes for easy pickin’s. Coyotes will eat just about anything. I actually love coyotes and during the summer I will usually see one traveling through my yard occasionally. I just have to make sure the cat is inside at night. So nice of Mick to go to all that trouble to help everyone out. Special dude! I appreciate that Mick is your personal angel, but how of him to share that information for all of us. Many thanks, Mick ! And to you Sue! I meant to say ” how NICE of him ..” Geez, I’m trying to be gracious and leave out the most important word. WOW! Mick did an outstanding job with the details of parts needed, pics and instructions. I liked how he went thru the specifics on why you need to do it a certain way. ( I always hate buying something and getting quasi instructions which normally consists of pictures, numbers and letters..no details.) Thanks Mick for taking the time…not to mention sending RVSue the Wilson antenna so she can blog from almost anywhere. It feels like Christmas in Jan…as St Mick does it again. From his actions it appears that the coyote isn’t scared of people. That in itself is a bit alarming. For a minute there..I was amazed that it stood and looked at the camera….then I read on. Rusty made me chuckle…as I can hear him preforming his coyote call! Spike..everyone knows you are the protecto dog! That’s your job…but you be careful. You don’t eat Bridget’s chicken do you? There is plenty..just ask RVSue for another piece. I’m sure she’ll give you part of her’s. Outstanding job from Mick…very impressed I must say!! We have wild life come into town occasionally i.e. bears, coyotes, rattlesnakes, etc. Coyotes visit outlying neighborhoods to eat cats, dogs and garbage especially late evenings & early mornings. I usually walk outside with my dogs in the morning but in evening there is too much activity in the park across the street for wild life visits. My sister’s dogs are big labradors. 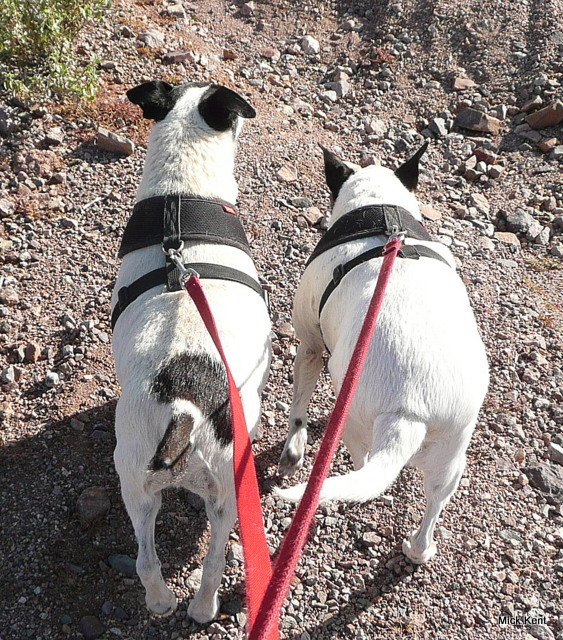 They chased a coyote and fought with it then came back w/torn ears….coyote never came back. It was scary cuz coyote could have had rabies or could have done some serious injury to sister’s dogs. My sister does not leash her dogs cuz she lives in country. Yes, be very careful w/Spike & Bridget outside. I made a rattle out of a empty coffee can with pebbles inside and squished the open end. The can is then attached to a coat hanger to throw or rattle at wild life. My grandma taught me how to make these noise makers to scare wild life away while walking in the woods. Spike & Bridget are so adorable…their corner makes me laugh! Very generous and nice of Mick to share antenna set up. A very nice gift. There are such animals as Mexican Black Wolves. They are scarce as hens teeth and if you’re lucky you might just see one down in your neck of the desert. They are just a little bit bigger than Coyotes and have a darker coloring usually. 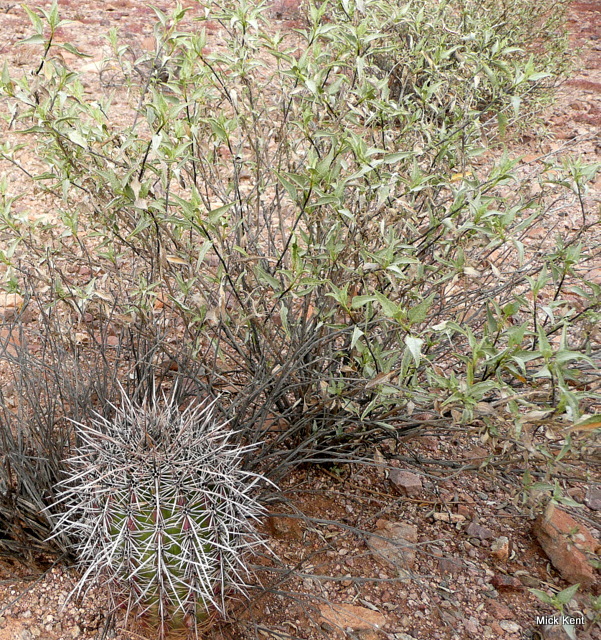 I love them both, as they give a special balance to the desert enviroment. My dog ran with a small black gal last yr and this yr we have made “friends” with a small red girl. As the winter is going to snap into nasty _and mating season is days off_that is the time we keep our distance. and yes, folks who leave their pups out to pee in the back yard lose them quickly. Where we stayed near the Chocolate Mts. people would walk their dogs in the desert. One man had a small dog & saw two coyotes one on each side stalking his dog. He called the dog back & picked it up & headed back to the camp fast. Another lady let her cat out & never saw it again. The coyotes need to eat. Love that picture of the coyote. I love coyotes and have seen them so many times hiking around in Southern Cali over the years. They are quite funny to watch, they are so smart and savvy. Glad you decidd to use the leash. It made me nervous thinking thrre might be coyotes about. Clearly “protection” does NOT include rotisserie chicken…good thing Spike cleared that up! It’s good to know the boundaries! WOW…..coyote in your campsite today and havoline in ours! Fortunately our canine crew were also in our rig at the time. We haven’t heard any coyotes at night here (on Darby Wells Road) but now will keep an even tighter rein on our crew knowing they are close. Love Spikes confident attitude and I’m sure Bridget feels safe with him keeping watch. I don’t know about the chicken though…… Perfect picture for today’s Canine Corner! MISTAKE WARNING – I made a mistake on the U-bolt size of the muffler clamp. The clamp that the link points to has a 3/8 inch U bolt and needs a 3/8-16 Knob and nyloc nut. If you buy the muffler clamp from a local source be careful as they come with both a 5/16 and 3/8 inch U-bolts. RvSue will be correcting the Antenna Mount post. Sorry! Thank you, thank you Mick! WHEN I finally get my rig I will be installing one of your Wilson antenna systems. You are RVSue angel for sure….and an angel to the rest of us as well. Sue, I can’t seem to find Mick’s instructions as to installing a Wilson antenna. Where can it be locate?